(23 Sep 2009) Professor Peter Winkler has been awarded a 3-year grant from the National Science Foundation, entitled Combinatorial Methods for Random Structures in the Plane. Pete Winkler is co-organizing a semester program Phase Transitions and Emergent Properties at ICERM (Institute for Computational and Experimental Research in Mathematics) at Brown, starting February 2, 2015. Darwin&apos;s Extra Sense — a video by Wendy Coquest, Bob Drake and Dan Rockmore. The Math Life — a documentary film by Wendy Conquest, Bob Drake and Dan Rockmore. Emeritus professor John Lamperti published a joint paper with Arlene Ash in the journal Statistics, Politics and Policy studying the new laws and rules that are making it harder to vote in many states. A short version of the paper is available here. Process, Not Particulars, by Matt Stumpf - Using the concept of isomorphisms in defence of an education in the humanities. Math Professor Helps Uncover Art Fakes, by Joe Palca, NPR's Morning Edition, 9 Feb 2010. Dartmouth Team spots forgeries by the numbers - From the New Hampshire Union Leader, Friday, January 8, 2010. The Van Gogh Project: Art Meets Mathematics in Ongoing International Study - From SIAM News, Volume 42, Number 4, May 2009. Floridas District 13 Election in 2006: Can Statistics Tell Us Who Won? by Arlene Ash (Boston University) and John Lamperti (Dartmouth), appeared in Chance. 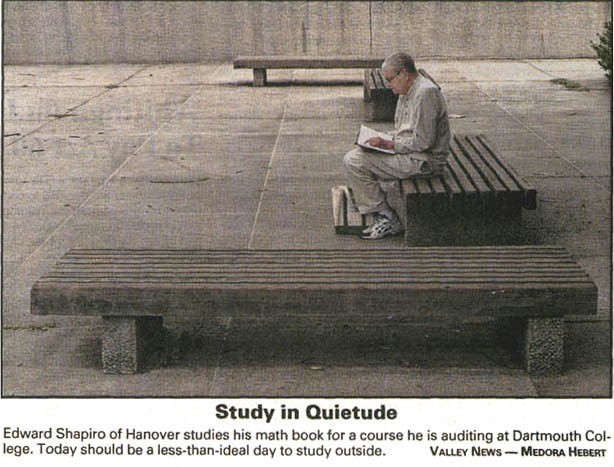 Edward Shapiro (Valley News front page, 13 August 1999). Professor Peter Winkler speaks on Sudoku-mania (The Exchange on NHPR, 2 June 2006).